Raja Koduri says that Intel has got all the right LEGO blocks to create the leading discrete graphics architecture of the future. 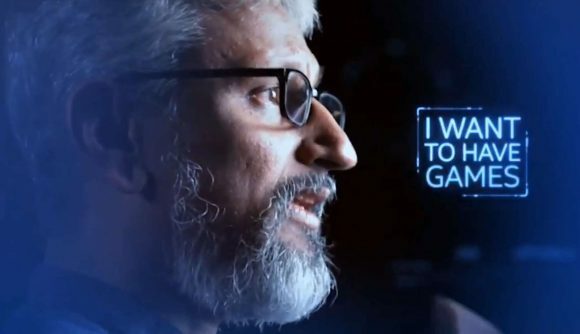 But then he would say that as the promo video he’s talking in is designed to pull the best GPU engineering talent away from AMD and Nvidia and into Intel, in order to help push its discrete graphics initiative forward. Spicy. But to be honest, Raja had me at “it’s kind of like building a really complex LEGO structure,” which I guess means I’m eminently qualified. I have only the most rudimentary knowledge of creating a GPU, but I can build a LEGO TIE Fighter in my sleep. New, reportedly reluctant, CEO Bob Swan also pops up to talk about the “unique opportunity” that Intel’s push into discrete graphics could mean for the company, anyone joining it, and potentially [movie trailer voice] the world. But the set of IP that Intel has at its disposal, and not just that used within its current integrated graphics cores, is what’s currently exciting him.